Pilgrim Paths week 2019 will run from Friday April 19th, through EASTER and then on to the following Sunday, April 28th. 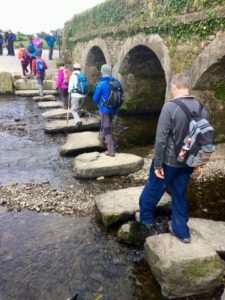 Pilgrim Paths Week, which is now in its 6th year, is an Eastertime Festival based on Ireland’s network of pilgrim walking routes. This heritage themed event is organised by the local communities adjacent to each penitential route and is aimed at raising awareness of Ireland’s rich inheritance of pilgrim paths. It is targeted not only at those who enjoy exploring ancient tracks imprinted with the footsteps of penitents past, but also at the growing numbers seeking walkways with deeper significance. Pilgrim Paths Week provides a warm welcome for participants of all religious backgrounds and those without religious affiliations. It is planned as a unifying time emphasising Ireland’s common Christian heritage and is designed to facilitate a deeper understanding of the country’s historic past. Every effort will be made to facilitate the participation of families, the less fit, and in so far as possible, those with special needs in a unique event aimed at rediscovering Ireland’s rich medieval and mystical inheritance. Most of the pilgrim walks will be single day events; a few will be multi-day outings, but all will be targeted at returning a degree of deeper reflection on, and appreciation of the Irish outdoors, to the Easter period. Cnoc na dTobar, Co Kerry, Guided walk ascending the 14 Stations of the cross to celebrate Pilgrim Paths Week. Information: 087 7942134, Email: skelligkerry@gmail.com. Full outline of event on the Cnoc na dTobar page here. Free guided 18km walk to celebrate Pilgrim Paths Week. Meeting at 10am at Ventry Beach Car Park. Contact, 087 2518174, Email: foh@udaras.ie. Further information on the event can be found here. Details of event updates will be posted regularly on Pilgrim Path’s Facebook Page, like and share to be informed when there are new events.